Complete assistance to skin any 3ds Max rig ! LH | Auto-Skin will automate all the heavy skinning, leaving only finition to make manuelly, or even, in somes cases, skinning will not need editing! To make this operation, the tool will generate a "sliced" character/object, animators will be able to use this low character/object to animate more faster! 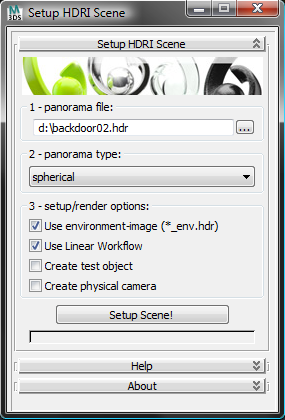 This tool creates a scene setup for HDRIs downloaded from www.zwischendrin.com and adds a test object (with materials), a camera and uses linear workflow if you like to. This script will setup either a bone or a cylinder (with a flex modifier), between two points. the controls to animate them!